Today our homeschool group had a field trip to Cedar Cove Feline Sanctuary & Education Center in Louisburg, KS. 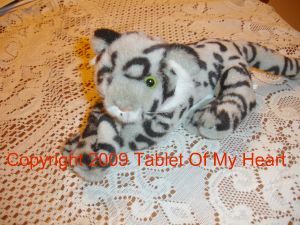 They have six or seven big Siberian tigers, a white tiger, cougars, bobcats, caracals, and wolves. The center is staffed by volunteers who are dedicated to helping preserve endangered large cats, and educating the public about their behavior, physiology, habitats, and threats of extinction. Our tour guide, Steve, was extremely knowledgeable about the animals, and let us admire them as long as we wanted, patiently answering all our questions. His love for and dedication to the animals at Cedar Cove is very evident. The center has an all-volunteer staff. One of the tigers was playing with his dish here. They are such gorgeous creatures! I could have watched them for hours! In a larger grassy area where there’s more room for one of their big male tigers to roam, Steve was able to get him to run alongside him by the fence. The tiger even allowed Steve to pet its head. 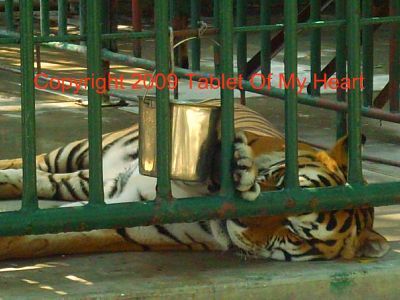 It takes a long time for the animals to get used to a volunteer’s appearance and smell, and even then Steve and other volunteers – or even the owner – do not get into the cages with them, because of the risk of attack. None of the animals have ever escaped the center that has been open since 2000. It is secure. The owner, Billy Pottorff, was a Vietnam Veteran, who saw many big cats lose their habitat during the war and pledged to help. 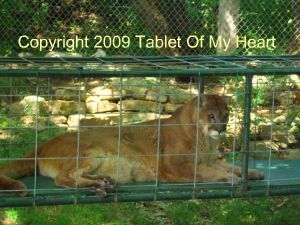 This cougar is 18 1/2 years old, which most cougars do not live to in the wild (their average life span is 8 to 13 years there). They have the greatest range of wild mammals in the Western Hemisphere, living in Canada all the way to South America. They are also known as pumas, panthers, or mountain lions. They eat deer, elk, bighorn sheep, horse, and cattle. They can run up to 45 mph. They are well known for their screams, but rarely attack humans. This guy was absolutely beautiful. The owner of Cedar Cove, Billy Pottorff, has had two timberwolves since they were pups, a brother and a sister. Timberwolves are also called gray wolves because they’re often gray, but can be white or black. They live in North America, Europe, and Asia. They travel in packs in the wild. There is usually an alpha(dominate) male and an alpha female in the pack. As Steve was interacting with the wolves, they would try to assert their dominance with each other. If one jumped on him, the other had to jump on him, too. In the wild, wolves eat birds and mammals like deer and caribou. 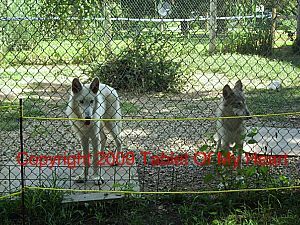 These timberwolves at Cedar Cove are now seven months old, and are used to our tour guide Steve’s appearance and smell. 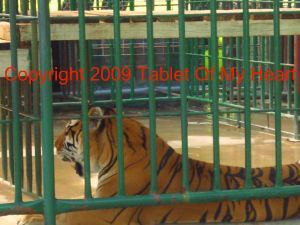 They played with him inside the fenced area, just like a dog would! They would put their nose into his hand for him to pet them, and jump on his chest for him to stroke their fur. They resemble Alaskan Huskies, but are much leaner – with a lot sharper teeth! Despite the fear surrounding them, wolves do not usually attack humans, except in cases where it’s trying to protect its territory from invasion. This medium-sized, spotted cat is called a serval, an African wild cat. It has long legs, and can run up to 50 mph. In the wild, it eats birds, hares, fish, insects, and frogs, but can also eat larger animals like gazelle or springbok. It can jump very high, is highly intelligent, and has incredible problem-solving skills. 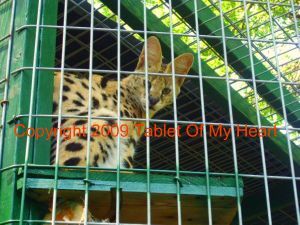 While we observed the serval at Cedar Cove, it jumped from Steve’s arms onto the fence, and began climbing toward the roof of the pen, looking for any openings for escape, then quickly jumped onto a branch a few feet away. We were surprised at how the serval allowed Steve to hold him, just like a house cat would! We had a great time at the center. It’s open to the public year round. Admission is $5 for adults, and 5 years & under are free. And of course, after you enjoy your tour, the kids can shop at the little store that has a variety of souvenirs such as buttons, postcards, and soft, stuffed animals in all sizes. Our daughter Leah picked out hers, too. This is a great place to take your family for affordable, educational “wild” summer fun!